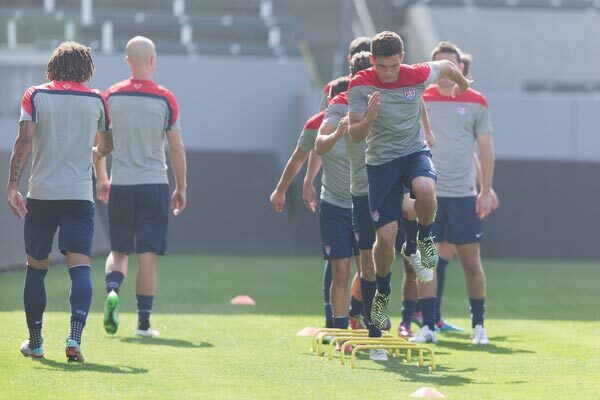 By Charles Boehm – WASHINGTON, DC (Feb 7, 2015) US Soccer Players – An outspoken head coach, a natural period of transition, and a 1-3-2 mark since the close of the 2014 World Cup lead to a heightened aura of anticipation ahead of the USMNT‘s meeting with Panama at StubHub Center in Carson, California on Sunday (4pm ET, ESPN2). Friendlies at this stage of the calendar are often understated affairs used to evaluate young players and newcomers. The evolving nature of the January camp has brought some of the current player pool’s core members into the fold this year. They join the parade of new faces at the beginning of a new World Cup cycle. The increasing number of MLS-based USMNT regulars, combined with last week’s comeback defeat to Chile, has prompted Jurgen Klinsmann to speak out several times on the question of fitness. Put in context with his previous lamentations regarding MLS’s spring-to-fall schedule and slightly longer offseason break, those statements would appear to have a strategic intent ranging well beyond the immediate situation. His words have prompted no end of chatter in American soccer circles. Whatever your reactions to them, the job of the players is to perform. That alone is a powerful motivator to push as hard as possible in their last USMNT match for at least six weeks. They’ll probably well-served by that extra spark against an opponent who’ll carry the lingering memories of their US-inflicted heartbreak on the final day of CONCACAF World Cup qualifying. USMNT fans are well acquainted with the heroics of Aron Johannsson and Graham “San” Zusi on that fateful night in Panama City. While no friendly win can ease that sort of pain, Los Canaleros are also keenly eager to assert a lasting place among the region’s elite. Half a dozen members of manager Hernan Dario Gomez’s squad have fresh experience on beating the Yanks. Gomez included several leading lights from the U-20 team that upset their US counterparts 1-0 in last month’s CONCACAF U-20 Championship in Jamaica. Panama took a surprise automatic World Cup qualification ahead of Tab Ramos’ talented group advancing from the playoffs. Given the chance, those kids won’t hesitate to assert themselves at senior level. Klinsmann seems likely to continue his tactical tinkering. The 3-5-2 formation presented some intriguing possibilities in Rancagua last week. The benefits of two flying wingbacks were clear on both USMNT goals. Meanwhile, the shape and coherence of the three-man back line appears the most pressing concern. “As we said down in Chile, we want to have different variations in our approach,” Klinsmann told reporters this week. “For whatever reason. Maybe the reason is the players you have available, or the reason is based on what the opponent brings to the table…. We just want to have this card in our pocket when we need to play it. Will Klinsmann persist with the same personnel in the new shape? Or will fresh faces like Wil Trapp, Dillon Serna, Gyasi Zardes, and Miguel Ibarra have more opportunities to impress? Veteran Jermaine Jones is a deeply-valued foundation of this team on multiple levels. His honest admittance of discomfort as the centerpiece of the three-man defense raises the prospect of an audition for someone else in that challenging spot. In central midfield, the chemistry between #8, #10, and #6 is pivotal in 3-5-2. We could see any number of combinations including and beyond the Michael Bradley-Mix Diskerud-Clint Dempsey axis fielded vs Chile. Dempsey may find himself in a more advanced role, given that Bobby Wood, Jozy Altidore’s starting strike partner last week, departed the camp to complete his transfer to German club Erzgebirge Aue. Chopping, changing, and experimenting is the expectation for both sides. The pressurized heat of qualifying remains impossible to reproduce. However, a dose of extra emotional investment on a sunny SoCal afternoon is welcome all the same.